Christine Blasey Ford, a psychology professor at Palo Alto University, tells The Washington Post that Supreme Court nominee Brett Kavanaugh sexually assaulted her when they were teenagers. Ford tells the newspaper that Kavanaugh and a friend corralled her in a bedroom during a gathering at a house in Maryland in the early 1980s. She says that both boys were "stumbling drunk" and that the friend watched as Kavanaugh pinned her to a bed and clumsily tried to pull off her clothes. She says she tried to scream and Kavanaugh covered her mouth with his hand. Ford says she escaped when Kavanaugh's friend jumped on top of them and they tumbled. 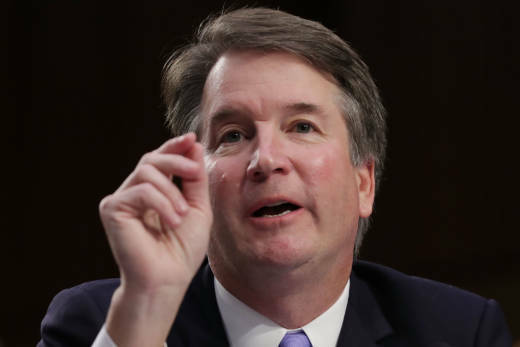 Shortly after The Washington Post published Ford's account, both of California's U.S. senators offered their support and called on the Senate to delay Kavanaugh's confirmation until after an investigation into Ford's allegations. In a tweet, Harris called Ford courageous and called her allegation "credible and serious." "The Senate has a constitutional responsibility to scrutinize SCOTUS nominees," she wrote on Twitter. "A vote on Kavanaugh’s nomination must be delayed until there is a thorough investigation." The Senate Judiciary Committee is scheduled to vote on Kavanaugh's nomination on Thursday. Last week, The New Yorker reported on the alleged incident, but had not released the accuser's name. In the same piece, The New Yorker reported that the accuser had written a letter detailing her allegation to Peninsula Congresswoman Anna Eshoo and Feinstein. "Feinstein’s decision to handle the matter in her own office, without notifying other members of the Senate Judiciary Committee, stirred concern among her Democratic colleagues. For several days, Feinstein declined requests from other Democrats on the Judiciary Committee to share the woman’s letter and other relevant communications. A source familiar with the committee’s activities said that Feinstein’s staff initially conveyed to other Democratic members’ offices that the incident was too distant in the past to merit public discussion, and that Feinstein had “taken care of it.” On Wednesday, after media inquiries to the Democratic members multiplied, and concern among congressional colleagues increased, Feinstein agreed to brief the other Democrats on the committee, with no staff present." In her statement Sunday, Feinstein said, "It has always been Mrs. Ford’s decision whether to come forward publicly. For any woman, sharing an experience involving sexual assault—particularly when it involves a politically connected man with influence, authority and power—is extraordinarily difficult." Eshoo said in a statement Sunday, "I am proud of my constituent for the courage she has displayed to come forward to tell her full story to the American people. In weighing her privacy and the consequences to herself and her family, she has demonstrated her willingness to risk these factors to present the truth." Eshoo did not comment on whether Kavanaugh's nomination should be delayed pending an investigation. Ford's lawyer did not immediately respond to a request for comment. This post has been updated to include a comment from Congresswoman Anna Eshoo. Reporting from the Associated Press was used in this report.